“A goal properly set is halfway reached” a quote by Zig Ziglar is true to its nature. We all have goals in our life, but, properly organized and planned goals are the ones that are achieved. Writing down your goals is also important. 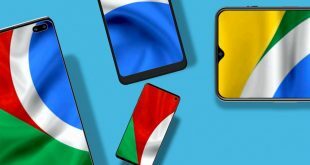 So, if you are looking to plan a goal and track your progress, here’s a compiled list of best goal tracking apps for Android. Habit tracker (or HabitBull on iOS) is the star of this list that helps you track your goals in an organized way. May it be a bad habit that you want to get rid of or a good habit that you would like to develop. Habit tracker is highly customizable according to your needs. One of the best assets of the app is that it is highly user-friendly that even your grandparents will figure out. Starting with creating a new goal/habit tracker, it recommends the popular goals/habits. For example, you can add new habits like working out daily for a month. Now, every time you hit the gym, you can open the HabitBull app and mark the day as a success. Don’t worry, you can also set a reminder, so there’s no chance of missing any activity of the day. 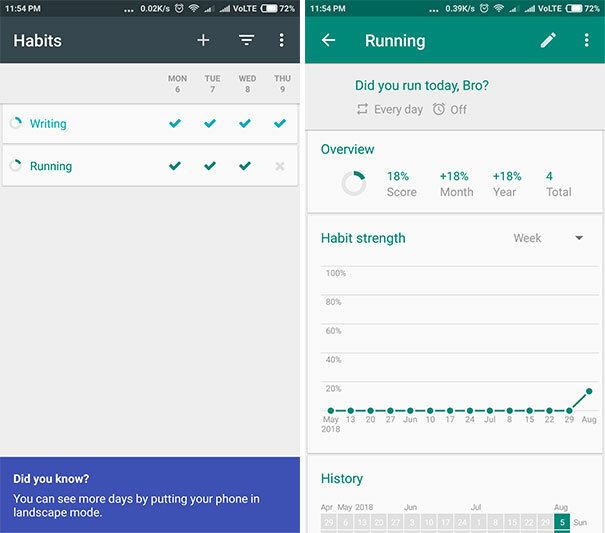 The app also shows you the stats for each habit so that you can keep track of your progress. The integrated calendar also gives you a better idea of your goals and habit patterns. Another cool feature it has is the widgets, that you can add to your home screen. The app is also available on iOS, so if you made a switch in future, all your data will be there. Pros: Reminders, calendar-based goal tracking, a forum for discussion, motivational images, highly customizable. 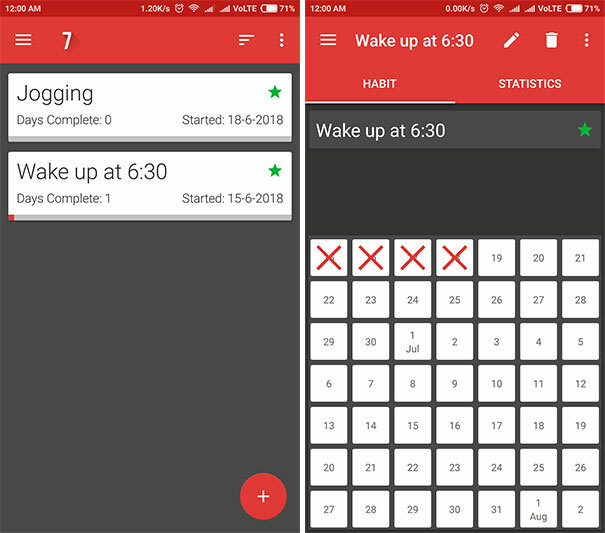 Download Habit Tracker from Play Store. 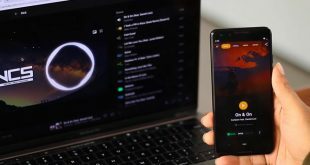 If you are looking for a more subtle app with fewer features than Loop is the best goal tracker android app to go for. The app is open source and completely free to use. You can create as many habits/goals you want; no limits on that in comparison to the above mentioned app. Also, you need not sign up for an account to back up your data. You can manually export the database or specific habit and use it later on another device by importing it. Talking about the features and usage, the app is pretty easy to use. While creating a habit you can set a reminder for a specific time and even set a question that should be shown during the reminder. You can set custom days for your habit, as in if you want to set up a habit every Thursdays and Fridays. Customizations include setting a specific color for a specific goal/habit which can be helpful to differentiate them. Apart from that, one thing I liked is that you can set a reminder as sticky in your notification drawer. This can be extremely helpful as swiping away notifications or clearing the notification drawer nowadays has become a habitual task. One another great feature I liked is the statistics page of the goal/habit. This is where you can actually track your goal and see your progress. You get a line chart and calendar history depicting how your progress has been in the past month. You can sort by months, days, weeks, quarters and years. 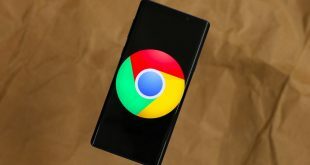 Pros: Open source and completely free to use without any restrictions, no sign up required, detailed statistics page, sticky reminder notification, and useful widgets for the home screen. Cons: Doesn’t show up the reminder notifications sometimes, no integrations to apps like Google fit. Download Loop – Habit Tracker from Play Store. Yes, you read that right. LifeRPG (RPG short for Role playing game). The app turns your daily life into a game. In a game, you get points/XP when you level up, so, same is the case with this app. When you complete a habit/goal of the day you get XP and points. Each habit/goal is a mission. While creating a mission you set its duration and how much XP you would like to gain on completing it every time. You can set different parameters for the mission like how difficult it is, the level of fear and how urgent it is. There are many other customizations available in terms of setting the time. You can also break down mission into sub-missions to make it more interesting and well planned. You can set custom sounds when you level up, complete a mission or master a skill. Charts are also available to analyze your week and how good you were with specific missions. Widgets are also available on the home screen for a quick view on your missions. You can add specific skills with every mission which you can develop as you progress in your mission. Apart from that, you can set custom rewards which you can get after completing a mission or a sub-mission. For example, have a cheat day after a successful 5-day streak of running. Best goal tracking app if you are into gaming and if you would like to approach your goal in a different way. Pros: Highly customizable in terms of setting time for your goal/habit, unique goal tracking features. 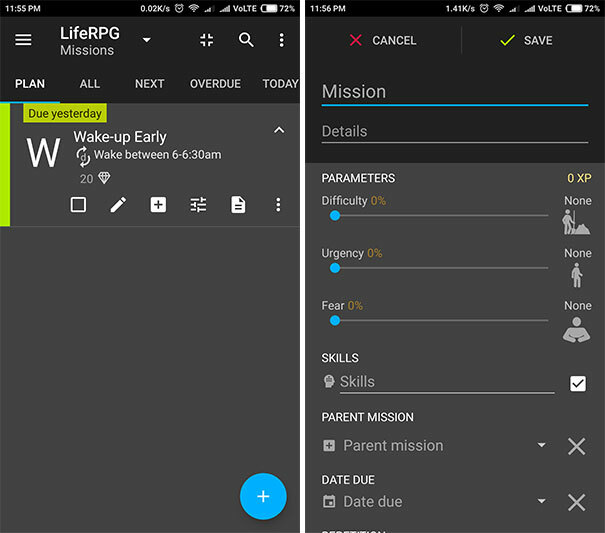 Download LifeRPG from Play Store. 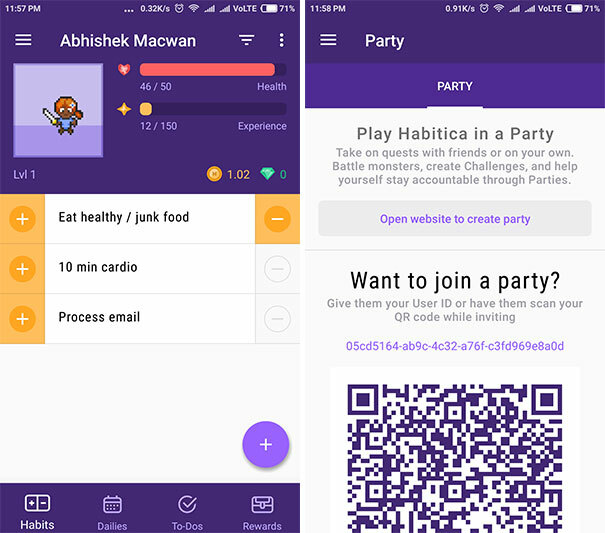 Habitica is another RPG based goal tracking app that is unique in its own kind. Unlike LifeRPG, Habitica is more subtle and more open. Open in the sense that you and friends together can help each other to complete your goals. It requires you to register an account in order to use the app. So, there are 4 different sections including Habits, Dailies, To-dos and Rewards. In the Habits section, you can add the good habits that you would like to develop and even bad habits that need to be removed from your life. In Dailies, you can set your daily schedule that you will have to follow. In To-dos, you set some random specific task that needs to be done later. As you complete your goals/habits and tasks you keep improving your avatar and gain rewards. Here in rewards, you can set your own custom rewards like watch an episode of your favorite TV show or take a cheat meal. On completing your task on certain levels you get these rewards. You can also buy these rewards with Gold that you get on completing your goals/habits/tasks. Another cool feature, it has that you can play this game with a group of people also called as a Party. So, when you achieve a goal your friends in the party reap the benefit by gaining gold/rewards. And when you fail, they too lose their gold/reward. This way the app helps and motivates you to complete your goals. It also an iOS and online version where you can access your details on the web browser. Pros: Provides motivation in form of rewards, the Party feature is great. Cons: No chart or analytics feature to analyze your goals. Download Habitica from Play Store. 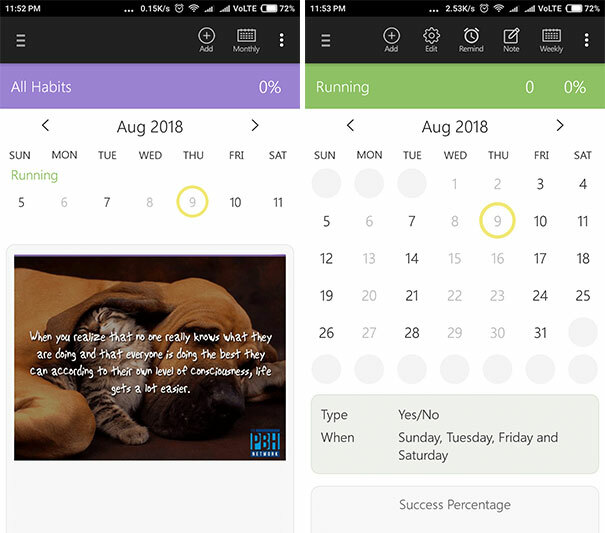 7 Weeks is an interesting goal tracking app that works on the concept of developing habits in 7 weeks (or 49 days). It is based on Charles Duhigg’s best selling book “The Power of Habit” and the X effect method of completing goals. So, basically, when you complete a goal on a particular day you put an X, stating you’ve done progress. When you fail you put an O. If you want the full experience of the app, then you will have to upgrade to 7 weeks+ app which has all the features. According to me, the free version is quite understating but the upgraded version will be the best to go for. The upgraded version includes custom alarms, flexible day settings for habits/goals, adding notes and multiple customizations for each habit. The free version doesn’t have any custom alarms or flexible day settings or any type of customization. You can just put an X and O and track your progress on the stats screen which shows the days completed and percentage of progress. Its the best goal tracking app for those who are looking for a subtle but effective app. Download 7 Weeks from Play Store. 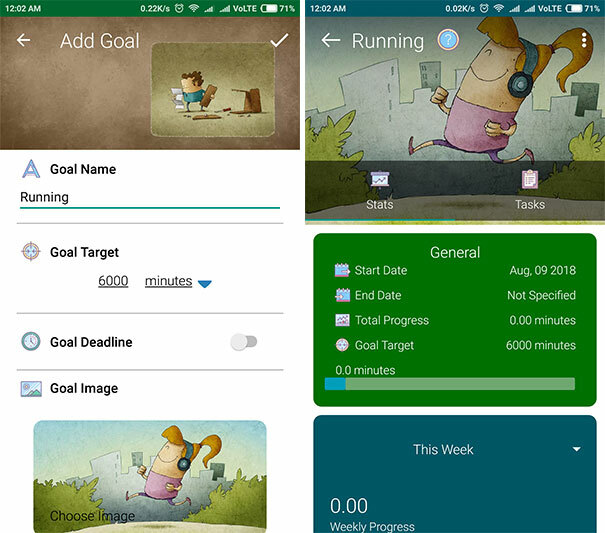 Goal Meter aims to work as all in one app that fulfills all your needs for Goal Tracking. It can work as a Goal/Habit tracker, To-do list, and a routine manager. You start by creating a goal in by choosing one of the categories or (create a custom category). If you happen to choose the predefined goals in the app then they can prefill your data for the goals based on the research data they already have for the goals. You can even customize your goal by setting different parameters of the goals that you need to achieve. For example, if you choose running you can set 1000 miles of running that you need to achieve and also set a deadline for it. Apart from that, you can divide your goal into chunks of tasks. This task can be added to your routine, so as you complete your routine you are also completing your goal. If you happen to find it hard to complete your goals, you can choose to get help from your friend by competing over the goal. In the Friends tab, you can add your friend and see each other’s progress. This way you can keep motivating each other to achieve your goals. It also has a very informative statistics page where you can track your goals and the progress. The free version of the app allows only 3 goals, to add more goals you need buy the premium version which also gives you access to home screen widgets. Pros: Intuitive goal organization, add tasks for your goals, get support from friends, informative stats page. Download Goal Meter from Play Store. Goalmap is a community-based Goal tracking app. You require an account to get started. It has a goal store from where you can choose a predefined goal or create your own. Creating goals is simple, you set a duration of the goal and set a reminder timing. You can see your goals in My Goals section and mark them as complete by tapping on the + icon as you progress every day. 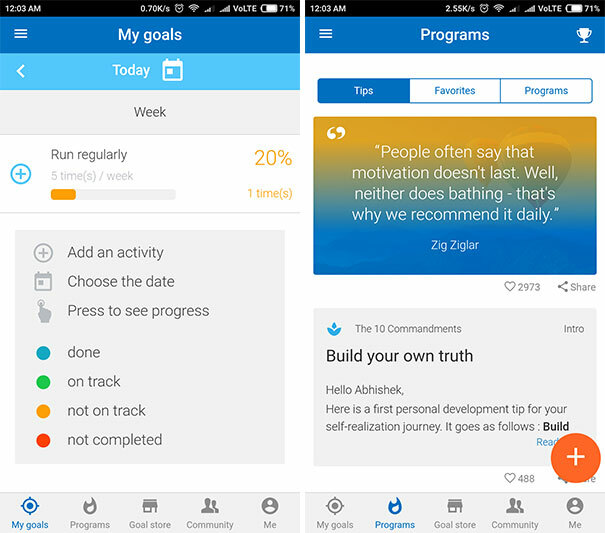 The app also keeps a log history for each of your goals. It also provides a graph of goal completion in the stats section. Apart from that, if you have some wearable device like Fitbit, you can connect it with this app and get a more detailed analysis of your goal. Only two wearable devices Fitbit and Strava are available for integration with the app. In the community section, you can communicate with other users about your goals and get motivation or find a solution to some problem. It is more of like a Forum for GoalMap. The app also has a premium version where you can subscribe to programs like ‘Boost My Productivity’; here you get advice and tips from an expert in form articles and videos. GoalMap is quite similar to HabitBull in terms of the community-based app. If you find it hard to achieve goals and would like to have some personal motivation then GoalMap is the best goal tracking app to go for as you can get motivation from the community and personal help from experts if you opt to go premium. Download GoalMap from Play Store. Lifetime Goals is more of a bucket list where you can add the goals that you would like to achieve in your entire lifetime. This app is very different from all the above apps and focuses on just maintaining and organizing a list of goals. You create a goal add it your own custom category (or to any of the already listed category), add a description and an image for motivation. After adding it, the Dashboard gets updated showing the number of goals you have in specific categories and how many of them you have achieved. When you achieve a goal, just tap on the completed icon and it gets added to your achievements list. Very simple but that’s what the app aims for, working as an effective bucket list for your life goals. And yes, there’s a reminder that you can set to remind yourself about the goals that you have to achieve. Download Lifetime Goals from Play Store. Best Goal Tracking App for You? So, this is our diverse list of best goal tracking apps that you can choose from. To make it a bit easier for you we’ll wrap this list with some recommendations. If you are looking for a lightweight but effective app for goal tracking, Loop – habit tracker is the one to go for. Are you more into gaming and would like to turn your life into RPG? Well, LifeRPG is the one to go for as it has lots of customizations available under the hood in comparison to Habitica. Looking for community-based goal tracking app? We recommend Habitbull as it has highly active Forums and discussion boards for motivation. Secondly, GoalMap is also recommended as it even allows you to interact with users in private chat. 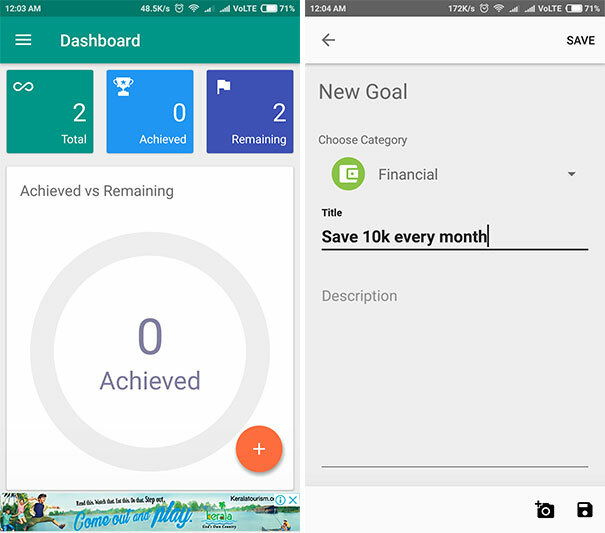 Lastly, if you just want to maintain a list of goals, Lifetime Goals is the best app to go for.